Famous as the ‘city of textiles and looms’, Bhilwara is home to the world renowned Ramdwara of Ramsnehi Sampraday. The founder Guru of the Sampraday, Swami Ramcharanji Maharaj, preached to his followers here and later decided to move to Shahpura. The present day headquarters of the Ram Snehi Sampraday, known as Ram Niwas Dham are located in Shahpura. 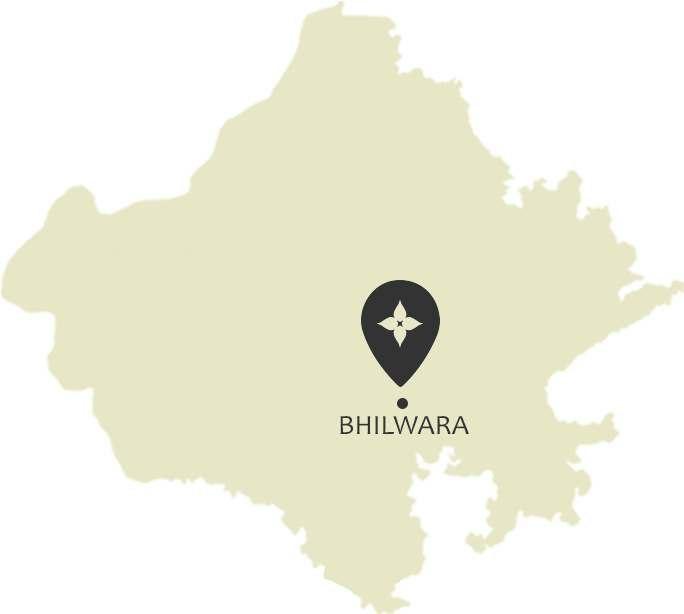 Some people say that Bhilwara got its name from the Bhils (tribal people) who lived there during the days of yore. As per a story, the city of Bhilwara had a mint that minted coins known as ‘bhiladi’. This is supposedly the origin of the district’s name. Bhilwara's cultural history can also be traced back to the Nagar Brahmins mentioned in the Skanda Purana. Come explore the wonders and sites that Bhilwara has to offer. There’s always something to see in Rajasthan. Pur Udan Chatri is about 10 kilometres from Bhilwara city. It is renowned for Udan Chatri and Adhar Sheela Mahadev, where the geographical wonder of a huge rock resting on a small one attracts tourists. The Kyara ke Balaji has an image of Lord Hanuman which the locals believe appeared naturally on the rock. When visiting Kyara ke Balaji, you can also visit other locations such as Patola Mahadev Temple, Ghata Rani Temple, Beeda ke Mataji Temple and Neelkanth Mahadev Temple. Cows are the livelihood for most of the locals in Bhilwara. Thus, the Madhav Cow Science Research Centre in the village Gaadarmala is very popular as it offers them knowledge and the know-how on how to better care for their animals. Located around 16 kilometres from Bhilwara city, is Mandal, where you can find the find the cenotaph of Jagganath Kachhawaha, better known as Battis Khambon ki Chhatri. As the name implies, this is a handsome chhatri (cenotaph) comprising 32-pillars made with sandstone. Some of them have beautiful carving at the base and on the upper portion. The chhatri also encloses a huge Shivaling. The Shakti Peetha is a place of worship consecrated to the goddess Shakti or Sati, the female principal of Hinduism and the main deity of the Shakta sect. In Bhilwara, the Gayatri Shakti Peeth is located near the main city bus stand. 3 kilometres away from Sangariya is Dhanop, a little village where you can visit the Sheetla Mata Temple. This colourful temple has bright red walls and pillars, a chequered marble floor and an idol of the goddess Sheetla (an incarnation of Goddess Durga) in black stone. 80 kilometrs from Bhilwara, on the Bhilwara-Kota road is a beautiful waterfall where the water falls to a depth of 150 metres into a V-shaped valley with great force, making for a beautiful sight. People from all corners of the State flock to take it in. The best time to visit the Menal Waterfall is from July to October. Triveni Chauraha is located 40 kilometres from the city of Bhilwara and is the meeting point of Menali River with Badachh and Banas Rivers. Along the coast is an ancient temple dedicated to Lord Shiva that remains submerged under water during monsoon. The Meja Dam located 20 kilometres from Bhilwara is one of the biggest dams in Bhilwara and is famous for its lush green park. It is a famous tourist attraction and favoured picnic spot. Located 15 km from Bijolia, are four temples, the principal of which is dedicated to Sarweshwar (Shiva), which reportedly belongs to 10th or 11th century. The temple complex also houses a monastery, a kund or reservoir and a toran or triumphal arch. 55 km from Bhilwara is the town of Shahpura. Surrounded by a wall with four gates, it’s a place of pilgrimage for the followers of Ram Sanehi sect founded amongst the Hindu in 1804. The sect has a holy shrine known as Ram Dwara, The chief priest of Rama Dwara is the head of the sect. Pilgrims from all over the country visit this shrine throughout the year. An annual fair known as Phool Dol ka Mela is held here in Phalgun Shukla (March-April) for five days. There is a large palace complex in the northern part of Shahpura, which is surmounted by balconies, towers and cupolas. It offers beautiful views of the lake and the town from its upper terraces. Kesari Singh, Jorawar Singh and Pratap Singh Barahat were famous freedom fighters who belonged to Shahpura. Trimurti Smarak, Barahat Ji Ki Haveli and Pivaniya Talab are other important attractions here. Shahpura is also famous for the traditional art form of Phad painting. 90 km from Bhilwara lies Jahazpur. Travel to the south of this town and perched atop a hill, you will find a large fort consisting of two ramparts, one within the other, each having a deep ditch and numerous bastion. It is alleged that this is one of the many forts erected by Rana Kumbha to protect the frontiers of Mewar. The village has a group of temples dedicated to Shiva called the Barah Deora. The fort also houses a few temples among which the one dedicated to Sarweshwar Nathji is said to be quite old. Jahazpur is well-known for an important Jain temple that is dedicated to Munisvuratnath. It also houses a a mosque, situated between the village and the fort, known as the Gaibi Pir, named after a Muhammadan Saint Gaibi who is said to have resided here during the reign of Emperor Akbar. The town, known for its temples, is situated on the left bank of the river Khari, built by Sawai Bhoj, the eldest son of Bagh Rao. During the princely rule, the town was an estate comprising seventy two villages, held by one of the first class nobles of the Mewar state, who held the title of Rawat and belonged to the Chundawat sect of the Sisodia Rajput. Located 54 km from Bhilwara, this place possesses historical importance as it was the scene of many battles during the medieval times. It is also famous in history as being the campsite of the great Mughal emperor Akbar during the Haldi Ghati battle. A half-mile long fort stands guard with low rampart wall and bastions encircling the crest of the hill on which it stands. The fort is said to have been constructed by a chief of the Balnote clan of Rajputs. The fort houses two temples, one dedicated to Lord Shiva called Jaleshwar and the other dedicated to Krishna called Bada Mandir. Be a part of the festivities and traditions that Bhilwara has to offer. It’s always a celebration in Rajasthan. The Gangaur Festival is celebrated in the month of April every year. Gan indicates Lord Shiva and Gauri is the divine consort of the Lord, hence the festival of Gangaur celebrates the divine bliss of Goddess Parvati. The women of Bhilwara have a special role to play in the Gangaur festival. Celebrated for 18 whole days, the Gangaur festival is a long, colourful procession. The girls of Bhilwara get up early, bathe, wear festive outfits, adorn their palms with henna and join the festive procession which also sees dance performances. Engage in the many activities, tours and adventures that await you in Bhilwara. There’s always something to do in Rajasthan. National Highway No. 79 and National Highway No. 76 pass through Bhilwara. Bhilwara is well connected to Ajmer, Jodhpur, Jaipur, Kota, Indore Junction, Ujjain and Delhi by rail.